3 stars campsite in the heart of a former spa resort of 8ha, at the foot of 18 valleys in the Pyrénées Ariégeoises, the campsite Audinac les Bains is a family friendly campsite with 115 pitches. Rentals : Chalets, Mobilhomes, Bungalow Tent, Pitches for tents and campers. The campsite is open from April 13th to September 29th. Ideal setting for your holidays in Ariège ! 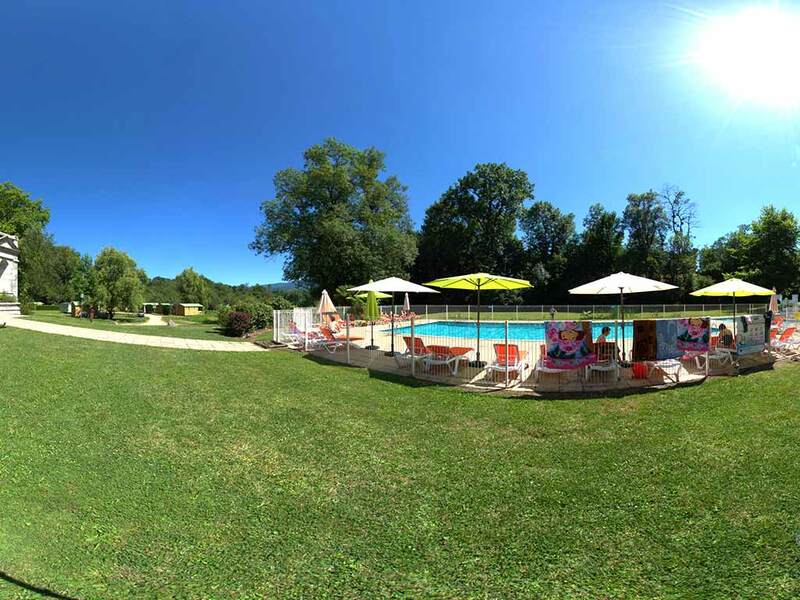 The campsite Audinac located in the heart of nature in lush greenery, with breathtaking views of the Pyrenees Ariègeoises, invites you to the scenery and relaxation. Bénédicte et Bruno are full of good ideas to make you live an original holiday : good plans and tips to get you to discover activities of all kinds and so live unforgettable and unusual experiences. With our partners we will give you the opportunity to go in groups to benefit from exclusive rates and thus meet people within our campsite. AMBIANCE AND SENSATIONS GUARANTEED ! activities and entertainment for everybody will complete your day. Located in Saint Girons in Ariège, the campsite Audinac has breathtaking views of the Pyrenees. The charm and authenticity of our valleys have been preserved and you can do there many activities: hiking ( we loan maps ), river fishing, canoeing, paragliding, Saint Girons and the Roman city of Saint-Dizier are only 3 kms away from the campsite, Toulouse at 1 hour, Andorre at 1h30min, The spa resort of Aulus Les Bains and Ax Les Thermes are near the campsite. Saint-Girons, the capital of Couserans. The ancient episcopal city of Saint-Lizier is the capital of the Couseran, it has Gallo-Roman ramparts and picturesque streets on both sides of two tumultuous torrents ( the Salat and the Lez ) coming from the highest mountain, that join in the center.